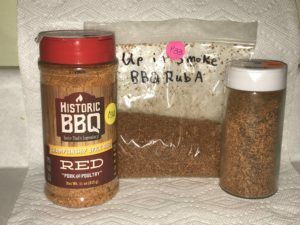 The National Barbecue News holds two events every year that are focused on helping readers and subscribers find the best barbecue sauce and rubs for chicken, pork, and beef. In 2017 we celebrate our 7th year of hosting and organizing these events that ANYONE can enter, regardless if you are a commercially available product or just a backyard enthusiast with a great product. Below you will find our winners list sorted for your convenience. We will also be posting up applications for upcoming events here as well. 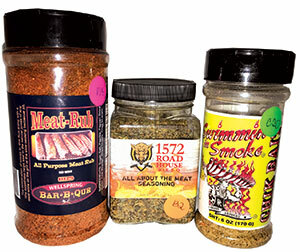 The annual Rubs of Honor contest is an event that is run by the National Barbecue News and is the only rub contest in the country that anyone can enter. 2017 Rubs of Honor National Champions presented by the National Barbecue News. Chicken champion rub (left) is Historic BBQ Red. Pork rub champion (center) is Up In Smoke BBQ Rub A and Beef champion rub (right) is Veterans Q beef rub. 10.Unbelieva-Bull – KO’D BBQ Co.
4) Deep Tissue Massage by Big T Spice Co.